Stain grade. The hardwoods, including cherry, oak, and maple, are too beautiful to be hidden beneath carpeting. These make an excellent choice for the visible stringers on a carpeted staircase, or as the treads and risers on an uncarpeted staircase. Combined with rich wood banisters and turned spindles, this can create the perfect staircase. Depending on your budget and your preferences, choose the wood that works best for you. If you prefer a more modern minimalistic look, you may be afraid that wood will overpower the other design elements in your room. Fortunately, this isn’t true. Your goal with the staircase is to make it work as a complement to the spartan design aesthetic in the space. This means clean, bold lines and neutral colors. Floating stairs. A pale wood, such as ash, white oak, or teak, can be striking when placed on single wall-mounted riser to create the illusion of a floating staircase. Combine it with glass railings to complete the look. Industrial chic. Simple wrought iron banisters with clean lines bring to mind the industrial era. Combine these with sturdy, block cut wood treads in a darker shade, such as sturdy oak, walnut, or maple. Concrete risers finish the look, providing clean lines with a hint of the industrial era. Either of these styles could work for you. Sometimes a cozier look is preferred, whether it’s cottage in the woods or the clean, open-sky feeling one gets from a beach cottage. Combining stained wood with painted wood is the key to achieving the right look. Whitewashed stairs. Paint is a necessity for successful cottage design. This means you can use one of the less attractive hardwoods-beech or hickory, for example. Highlight each whitewashed tread with a deeply colored riser, such as a dark-stained mahogany (which, incidentally, works well in ocean-side properties because it resists warping). Combine with wrought-iron railings with some decorative designs. Floral risers. Flowers are integral to country cottage designs. For this staircase, use oak or maple for a simple yet classy tread. The risers are best painted white, so you can opt for pine or another non-showpiece wood. Finish the look with wallpapered risers behind each step-a small cottage-style floral print is just the thing. Don’t limit yourself to a single material when planning out your staircase. Whether you want traditional grandeur, modern clean lines, or a homey cottage feel, a mix of materials is key to creating a focal point from your stairs. 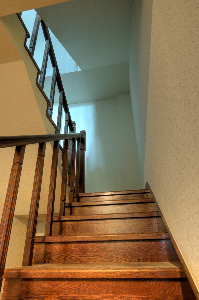 If you need help, contact an expert like Finelli Architectural Iron & Stairs. We’re more than happy to assist you.